One man’s extensive collection of stone rubbings from the Western Xia and Qing dynasties (1644-1912) was put on display at the Karamay Culture Museum on Jan 10. 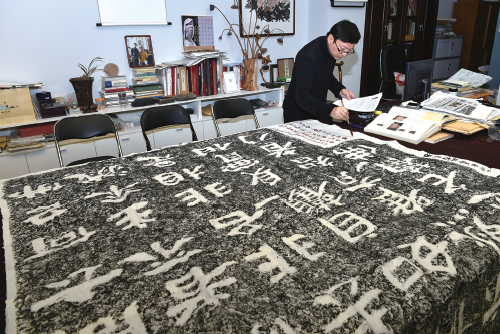 For the 30 years, Wang Yanchong, president of Xinjiang Karamay Calligraphers Association, has collected 366 pieces of valuable stone rubbings. Obsessed with calligraphy, Wang started his collection more than 30 years ago, spending most of his savings on buying up fine examples of the ancient practice. Many of the works have skyrocketed in value. Wang has meticulously looked after and studied every piece in his collection, examining their character and contents. He analyzed the rubbings and made detailed prefaces and postscripts for each to explain the origin and development. Stone rubbing is the practice of creating an image of surface features of a stone on paper. The image records features such as natural textures, inscribed patterns or lettering.